A multi-million Naira truck yard belonging to billionaire kidnapper, Chukwudumeme Onwumadike a.k.a Evans, has been uncovered by Policemen attached to the IGP Intelligence Response Team(IRT). 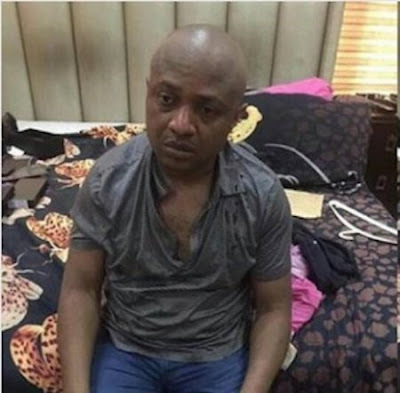 The Policemen also arrested one Ngozika Ezeokoye, Evans’ secretary who reportedly went into hiding after she learnt that police had nabbed her employer who used proceeds from kidnap operations, to establish several businesses including a haulage company that has not less than 10 trucks. Evans’ reportedly used his haulage company to access the financial worth of his victims, who hired his company. Sun News, reported that he also told the police that four of the most recent trucks acquired were gotten from the N150million ransom paid by one of his victims, Pharmacist Donatus Duno. Upon interrogation, the billionaire kidnapper’s secretary Ngozika, insisted that she never knew that her boss was into kidnapping. “I used to work with a bank till I retired because of the poor condition of work. I got a job with CMT motors in 2015. Initially, our warehouse was in Apapa till they moved us to 235 Ago Palace way in Okota in 2016. My job was to take note of trucks that go to work, their destination and amount due for each trip. The company has eleven trucks and all the vehicles original documents in my possession. The name of my boss is George Onwuamadike and every money is paid into Chinwuba multi trade limited.